The output from the Alpine power plant is sufficient to serve approximately 120,000 homes in northern Michigan. Image: courtesy of Wolverine Power Cooperative. The gas-fired power plant in Michigan was commissioned in June 2016. Image: courtesy of Wolverine Power Cooperative. The Alpine power plant is equipped with two 205MW General Electric (GE) Frame 7FA.05 turbines. Image: courtesy of Wolverine Power Cooperative. The two turbine foundations required approximately 800 cubic yards of concrete. Image: courtesy of Wolverine Power Cooperative. The 410MW natural gas-fuelled Alpine Power Plant is located within a 700-acre property in Elmira Township, Ostega County, Michigan, US. The project was developed by Wolverine Power Cooperative, a co-operative involved in the supply of wholesale electric power to six electric co-operatives in Michigan. It is a member of the Midcontinent Independent System Operator (MISO), the owner and operator of the facility. The project was announced in October 2014 and the natural gas-fuelled power plant was commissioned in June 2016. The facility’s construction required an investment of approximately $175m and generated 260 jobs during the peak construction period. The output from the power plant is sufficient to serve approximately 120,000 homes in northern Michigan. The Alpine power plant is primarily equipped with two 205MW General Electric (GE) Frame 7FA.05 turbines, air-cooled heat exchangers, silencers, an air inlet filter house, a diesel-powered back-up generator, hydrogen-cooled transformers, and a switchyard station. Its exhaust systems, measuring approximately 100m-high, were constructed using approximately 700t of steel, whereas the remaining structures were constructed to a maximum height of 70m. The project necessitated the transfer of approximately 65,000 cubic yards of material to the site for the construction of an 8.5-acre pad to accommodate the plant’s equipment and access facilities. Approximately 800 cubic yards of concrete were also poured for the construction of the two turbine foundations. Other major project activities included the construction of an administrative building incorporating a control room, and a 40ft-high common fire water tank for both the turbines. The electrical output from the power plant is conveyed to the substation at Hayes Township through existing transmission lines and is further conveyed to International Transmission Company’s (ITC) 138kV grid via a new 2.8mi (4.5km)-long transmission line. The substation was further expanded to accommodate the new capacity from the project. "The facility’s construction required an investment of approximately $175m and generated 260 jobs during the peak construction period." The natural gas for the power plant is sourced from an existing natural gas pipeline. The project necessitated the installation of new pipelines to interconnect with the existing pipeline. The Boldt Company was the general contractor for the power plant’s power island equipment, whereas the start-up and commissioning services for the plant were rendered by Bluewater Energy Solutions. POWER Burns and Roe, a subsidiary of POWER Engineers, performed the complete engineering and design services for the project. The site and civil services for the project were provided by Wade Trim, who also assisted the developer in receiving a number of permit approvals. 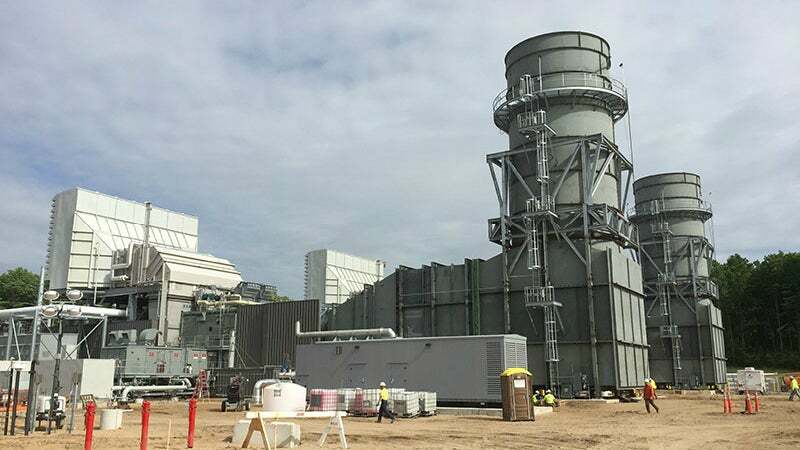 The transformers for the power plant were manufactured and supplied by Hyundai Transformer USA, whereas the two exhaust systems were supplied and installed by Moran Iron Works (MIW). E.C. Korneffel installed the foundation pilings for the two turbines, whereas DeVere Construction was contracted for the construction of the administrative building. The sound modelling report for the project was compiled by Hessler Associates. Some of the local contractors involved in the project include J & N Construction, Swan Electric Company, and MDC Contracting. Continental Controls Corporation is a leading supplier of fuel control products for both natural gas engines and gas turbine engines.